PACKAGE THIS TITLE WITH OUR 2016 MLA SUPPLEMENT, Documenting Sources in MLA Style (package ISBN-13: 9781319084448). Get the most recent updates on MLA citation in a convenient, 40-page resource based on The MLA Handbook, 8th Edition, with plenty of models. Browse our catalog or contact your representative for a full listing of updated titles and packages, or to request a custom ISBN. 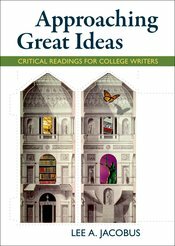 From Lee Jacobus, the author of A World of Ideas—one of the bestselling composition readers of all time—comes Approaching Great Ideas, a new reader for composition courses. Concise, scaffolded instruction aims to make “big ideas” accessible and relevant for students. The text introduces important writings from classic authors such as Aristotle, Plato, Charlotte Perkins Gilman, Charles Darwin, Andrew Carnegie, and Friedrich Nietzsche. Approaching Great Ideas then shows students how the ideas of these great thinkers are relevant today by presenting shorter readings on the same themes from contemporary authors such as Cornel West, Elizabeth Warren, bell hooks, Fareed Zakaria, Jennifer Ackerman, and Kwame Anthony Appiah. Two introductory chapters on critical reading and writing give students the proper, easy-to-use tools they need to approach, engage with, and respond thoughtfully to great ideas.